Saratoga Restaurant Row - See What These Restaurants Are Serving Up At The Race Track This Season! 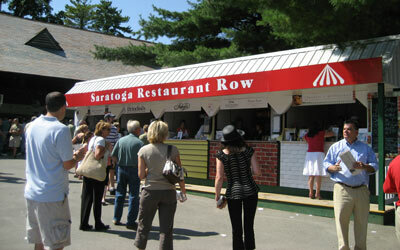 PLEASE NOTE: As of the 2014 season, there is no longer Restaurant Row at Saratoga Race Course. Restaurant Row offered trackgoers a range of Saratoga dining options at the track. Get a true taste of Saratoga while you're at the track this season! A fan favorite, Restaurant Row features a sampling of popular local restaurants that serve up some of their best recipes on site at the Saratoga Race Track all summer long. You can find Restaurant Row located in the Courtyard near the Executive Offices at the Track. Participating restaurants offer light fare and specialty house items. The "Other" Restaurant Row: Alternately, there is a stretch of downtown Saratoga Springs that has been affectionately dubbed "Restaurant Row" for years, but the establishment at the track is completely different.